The increase in intensification of aquaculture production has been accompanied by an increase in impacts of pathogenic diseases. Large populations of stock maintained in close proximity have left much of the aquaculture industry susceptible to major economic losses caused by disease. As a consequence, and due to the variety of negative impacts associated with chemotherapeutics, development of immunoprophylaxis has received great impetus as a preventive disease management strategy for finfish. The most commonly used methods for fish immunoprophylaxis - injection and immersion - are generally associated with high procedural cost and access constraints. Oral immunoprophylaxis strategies for finfish, the main focus of this thesis, are able to effectively obviate these constraints and have therefore been proposed as an ideal approach for fish health management. Due to performance inconsistencies linked to digestive degradation of orally administered antigens, oral immunoprophylaxis strategies have not been widely implemented in aquaculture. This thesis examined the feasibility of alginate microcapsules manufactured using a low impact technology and reagents to protect orally delivered immunogens for immunoprophylaxis of finfish. The microencapsulation method developed was found to be well suited for oral immunoprophylaxis of fish, as demonstrated by successful uptake of microcapsules and systemic distribution of contents ex vivo and in vivo, as well as the ability to affect controlled release of contents in target environmental conditions. The method also demonstrated no adverse impact on the integrity of the encapsulated substance, implying applicability to a broad range of immunoprophylactic materials. The microencapsulation method was adapted for use with live microbial cells, and its viability as a disease management strategy was assessed against pathogenic disease of temperate and coldwater fish, bacterial coldwater disease (BCWD), which is caused by Flavobacterium psychrophilum. The protective efficacy of a putative probiotic Enterobacter species (C6-6) against BCWD was examined when administered as an alginate microencapsulated oral treatment. A similar trial was performed to test the effectiveness of an orally administered, alginate microencapsulated live-attenuated vaccine (B17) against BCWD. In both trials, the modified method was successfully used to microencapsulate the live cell antigens while maintaining their viability. Though achieving significantly better fish survival than in untreated controls, oral administration of C6-6 was not as effective as intraperitoneal (IP) injection in protecting fish against BCWD. In contrast, orally administered B 17 achieved similar serwn antibody titres and survival as IP administered B 17, with survival in both groups significantly better than untreated controls. An elevated challenge pressure made it difficult to draw clear conclusions regarding efficacy, though the similarities in treatment outcomes suggested that orally administered B 17 could potentially approach the effectiveness of IP injected administration. Yersinia rnckeri, the causative agent of yersiniosis in fish, is is a ubiquitous finfish pathogen affecting a broad range of species, and has been responsible for severe mortality in fish stocks globally. It is also capable of establishing and maintaining asymptomatic infections in apparently healthy fish, which act as reservoirs of infection within populations. A non-destructive technique for reliable detection of low levels of Y. rnckeri is necessary for effective management of the disease. A highly sensitive quantitative real-time PCR-based assay targeting the Y. ruckeri 16Sribosomal gene was developed, capable of reliably detecting single-cell presence of the pathogen in spleen and faecal samples. The assay was able to detect Y. ruckeri in faecal samples at levels lower than previously possible, presenting the possibility of screening populations for asymptomatic infection without the need for invasive sampling. Y ersiniosis is conventionally managed by immersion immunisation in small fish and injected vaccines for larger fish. Large-scale Y. rnckeri infections have observed in fish smaller than typical minimum size immunised in the industry. Consequently, protecting fry at early developmental stages is important, and the effectiveness of an alginate-microencapsulated vaccine orally administered to first feeding fry was investigated. Significant protection following pathogenic challenge indicated considerable potential, though the treatments did not affect establishment rate of asymptomatic infection in survivors. The lack of typical adaptive immune responses made it difficult to draw clear conclusions regarding the mechanisms responsible for the protection observed. 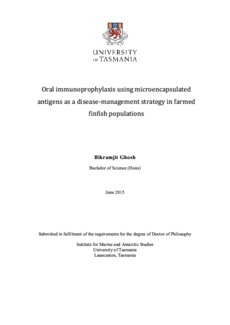 The work presented in this thesis establishes the feasibility of oral immunoprophylaxis for finfish. A versatile, low-impact alginate microencapsulation-based method for oral administration of a variety of immunogens is presented. Its potential as a health management strategy is demonstrated against known finfish diseases, though further optimisation of the approach will be greatly aided by an increased understanding of mucosal immune responses in finfish.